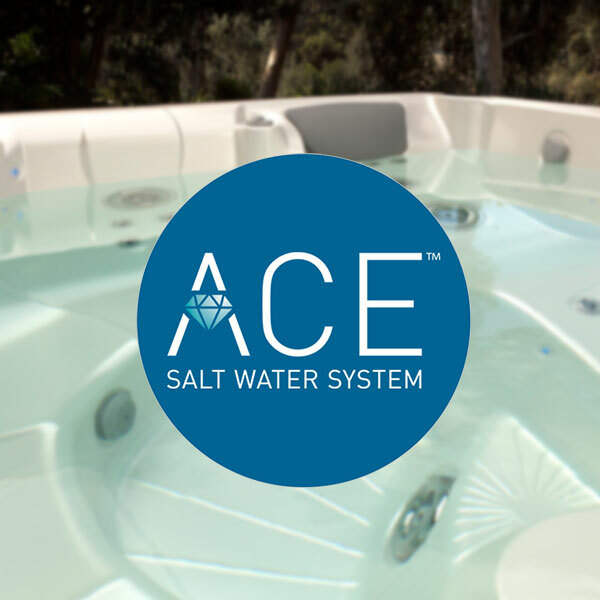 The low-maintenance ACE Saltwater Sanitizing System uses fewer chemicals, saves water and is gentle on the skin. Using advanced technology, the ACE Salt Water System automatically generates chlorine and other cleaners for a set amount of time each day, based on your input. This means the ACE system is sanitizing your spa water, even if you haven’t given water care a thought. When you chooose the ACE system, you’ll spend less time manually caring for your water and more time enjoying your spa. Plus, with proper care, you will add fewer bottled chemicals which will help spa water last longer. Because the ACE system cleans water differently than traditional water care systems, you are less likely to experience dry skin, irritated eyes, or chlorine odor. With softer and more luxurious spa water, you’ll find you spend even more time in your Hot Spring spa.